The lonely and those in need are being invited to enjoy a free festive meal being served up in Milton Keynes. Feedmk will be hosting a free four-course Christmas meal for those living in the city on Saturday, December 15. 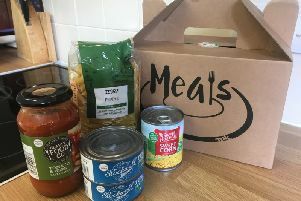 The meals are open to all, especially those in need at this time of year, including low-income families, single parent families, the elderly, any who are lonely or homeless and looking for community – everyone is welcome. As well as delicious food, guests can enjoy live music, mince pies, tea, coffee and biscuits, and there will be a visit from Father Christmas. There are five sittings offered throughout the day - at noon, 1.15pm, 2.30pm, 3.45pm and 5.00pm. This will be the 8th Christmas Feedmk and the third as a charity. A group of friends got together eights years ago, feeding 80 people at its first ever meal. Today, a volunteer team of 60 people from across the city now welcomes over 500 people three times a year to feedmk’s meals. Half a tonne of food is used for the Christmas meal, 4 minibuses head out across the city to pick up those who don’t have transport and who would like to come, and Feedmk has now become a firm fixture in the diary for many who have found a lasting community through their events. Invites are sent out through sheltered housing and SureStart schemes, local churches and FoodBank centres, Open Door and many other of Milton Keynes’ valuable support and community organisations. A spokeswoman said: “This year we have also been generously supported MK Community Foundation, Bletchley and Fenny Stratford Town Council through their grants schemes as well CrossFit Ampthill and other local businesses who have donated funds and goods.